During the journey, President Yu gave a speech about the development of Angel Egypt Factory and the role that it plays in the economic and social develpment of Egypt. The production capacity of Angel Egypt has increased from 15000 tons to 23000 tons, expecting to reach 35000 tons next year, becoming one of the largest yeast factories in the world. After the YE production line was put into operation, Angel Egypt will expand its exports to EU and some international big companies, such as Unilever and Nestle Company. As an environmental friendly factory, which promoted the agriculture circular economy, Angel Egypt has drawn attention of EBRD (European Bank for Reconstruction and Development) which voluntarily loaded 52 million dollars to Angel Egypt Factory. 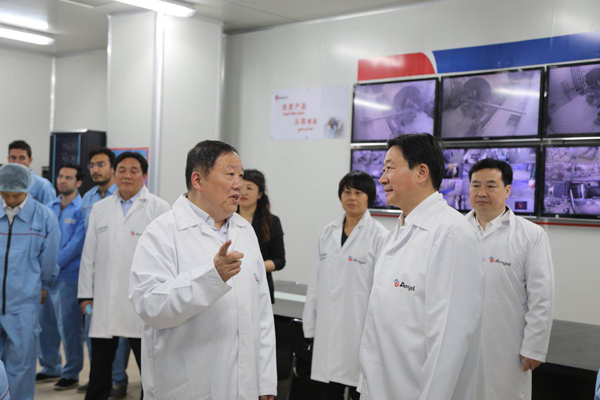 “The emission of Angel Yeast Company is ‘Focus on yeast biotechnology, innovate for healthy life’ and the goal of Angel Egypt is to ‘well build Angel Egypt Factory, promote the development of Egyptian industry’”, President Yu said, “Our employee should keep it in mind that what we are pursuing is not short-term interest. We are aiming at building centurial Angel and achieving sustainable development.